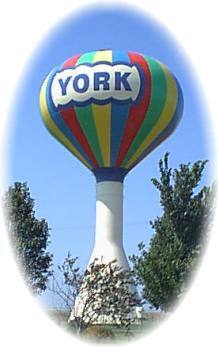 York's annual hot air balloon event during Yorkfest inspired York to not only design its water tower like a hot air balloon, but also to sport a smaller version of the now-trademark symbol in area parades and festivals. The city prides itself on its schools, churches, cultural facilities, and many civic activities. In addition to the large consolidated Class 3 public school system with an enrollment of about 1,300, there are several parochial schools. York College, a very positive factor in the community, was founded in 1890. Organized by the United Brethren, it is currently operated by the Church of Christ. The former Mother's Jewels home, now "Epworth Village," operates as a home and treatment center for troubled youngsters. From the standpoint of transportation, York is well located. I-80 is at the south edge of the city and Highway 34 runs near the north edge, with the Pan American Highway 81 running through town. A new airport adds to the facilities. Situated 50 miles west of the capital city of Lincoln and 44 miles east of Grand Island, York commands a large retail shopping area, and the "York Times" newspaper provides daily coverage of news and advertising to a wide area. The lifeblood of the area was, and is, agriculture. Corn, milo, soybeans, and a little wheat, and hay are the principal crops, along with the raising and feeding of hogs and cattle. York County, on the Ogallala aquifer, has an excellent supply of underground water. Deep-well irrigation currently is the key to a more stable agri-business. The name "York" comes from England. A notation, found below an English Coat-of-Arms, reads, "House of York, the capital of Yorkshire, England, after which American settlers of English ancestry have named three counties and their county seats. One is in Maine, another in Pennsylvania, and the third is York, York County, Nebraska." A historical marker stands at the York County Fairgrounds attributing the beginning of 4-H to York County. Prior to the turn of the century, York County's school superintendent, E.C. Bishop, who taught in nearby Bradshaw, had organized student clubs, with his students learning lessons on farm and home life. His projects included corn growing, sewing and baking. Similar student clubs were organized in other states at this time, but Bishop's organization is considered the beginning of 4-H clubs in Nebraska. These local groups grew to state-wide prominence. Bishop wrote: "We expect each of our members to learn to do something the world wants done and to lead himself into an education that will bring the fullest development of the triunity, 'the hand, the head and the heart'." Since the early 1900s a fourth 'H' "health", has been added, but Bishop's beliefs are still idealized in 4-H clubs. The York County Fair, a big event in August, maintains grounds and facilities north of town that are much above average. The local 4-H program and other youth-oriented programs round out the picture for this progressive and growing community. A current population of just over 7,700, our logo reads, "This is York -- where the best begins!" Outdoor water recreation is new to York at Recharge Lake. The experimental groundwater project has provided a site for ice skating in the winter and fishing, small boating, and swimming in the summer. The small lake is stocked with bluegill, bass, catfish, and Northern Pike. Golfers will enjoy the links at the York Country Club, known as one of the best 18-hole, grass green, golf courses in the state. Visitors to the York area are welcome to golf and use the facilities. Reciprocal agreements honored. Please call for reservations. The York Area Children's Museum has a multitude of reality-based displays that bring out children's fantasies based on the fun side of adult realism.